Faceted edges on this crystal flame catch the light to make it sparkle. Mounted on a black crystal pedestal, the flame, the pedestal or both can be personalized to recognize achievement. This premier crystal is packaged in a velvet lined gift box. This unique oblong crystal has beveled edges to catch the light and background color. Mounted on a black slant crystal on a clear crystal base, it boasts a modern design that offers a large area for personalization. 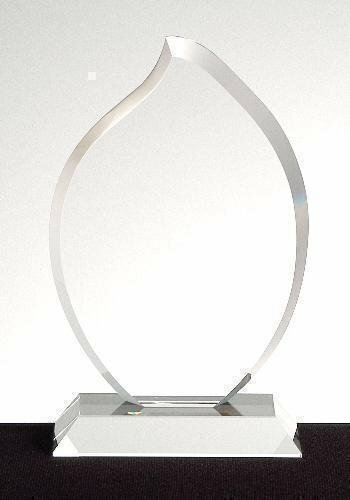 This stunning crystal award is a beautiful way to honor the high achievers and milestone events in your organization. This premier crystal is packaged in a velvet lined gift box.